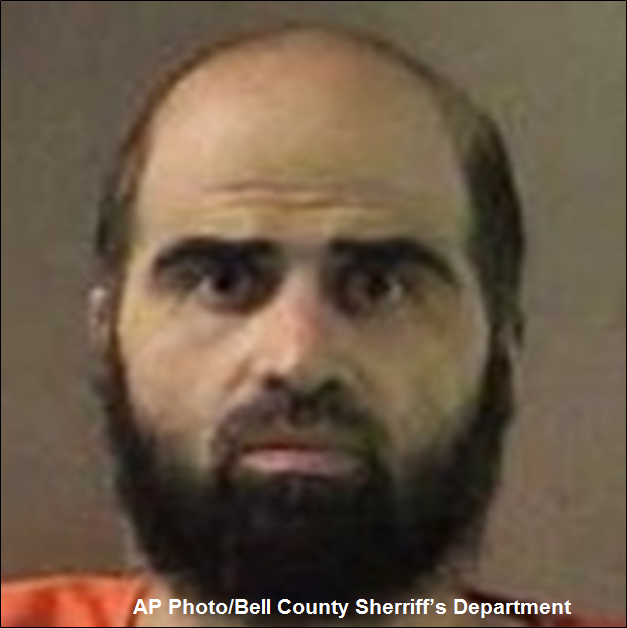 Billy Kenber, “Nidal Hasan sentenced to death for Fort Hood shooting rampage,” Washington Post, August 28, 2013, https://www.washingtonpost.com/world/national-security/nidal-hasan-sentenced-to-death-for-fort-hood-shooting-rampage/2013/08/28/aad28de2-0ffa-11e3-bdf6-e4fc677d94a1_story.html. Hasan is currently detained on military death row in Fort Leavenworth, Kansas.“Fort Leavenworth death row inmate Nidal Hasan appears at hearing in Fort Hood massacre case,” Dallas Morning News, January 29, 2015, www.dallasnews.com/news/state/headlines/20150129-fort-leavenworth-death-row-inmate-nidal-hasan-appears-at-hearing-in-fort-hood-massacre-case.ece. Hasan was born in 1970 in Arlington, Virginia, to Palestinian immigrant parents. In 1995, Hasan graduated with honors from Virginia Tech University with a degree in biochemistry. Following graduation, he attended Army Officer Candidate School, and was selected to attend medical school at the Uniformed Services University of Health Sciences in Bethesda, Maryland. Hasan graduated in 2003, later earning a master’s degree in public health.James C. McKinley Jr. and James Dao, “Fort Hood Gunman Gave Signals Before His Rampage,” New York Times, November 8, 2009, www.nytimes.com/2009/11/09/us/09reconstruct.html?pagewanted=all&_r=1. Hasan’s radicalization is believed to have begun as early as 2000 when, following the death of his parents, Hasan reportedly grew more overtly pious. In 2001, Hasan attended Anwar al-Awlaki’s Dar Al-Hijrah Islamic Center in Virginia, though it is not clear if the two interacted.James C. McKinley Jr. and James Dao, “Fort Hood Gunman Gave Signals Before His Rampage,” New York Times, November 8, 2009, www.nytimes.com/2009/11/09/us/09reconstruct.html?pagewanted=all&_r=1. In December 2008, Hasan contacted Awlaki through Awlaki’s personal website. Hasan asked Awlaki to “make some general comments about Muslims in the u.s. military [sic],” including Hasan Akbar, the U.S. army sergeant who killed two soldiers in Kuwait in March 2003.Manuel Roig-Franzia, “Army Soldier Is Convicted In Attack on Fellow Troops,” Washington Post, April 22, 2005, http://www.washingtonpost.com/wp-dyn/articles/A7210-2005Apr21.html. Hasan asked whether Awlaki would “consider someone like Hasan Akbar or other soldiers that have committed such acts with the goal of helping Muslims/Islam…fighting Jihad[? ],” and “if they did die would you consider them shaheeds[? ]”“Anwar Awlaki E-mail Exchange with Fort Hood Shooter Nidal Hasan,” IntelWire, July 19, 2012, http://news.intelwire.com/2012/07/the-following-e-mails-between-maj.html. The FBI intercepted the message but classified it as “Not a product of interest.”“FINAL REPORT of the WILLIAM H. WEBSTER COMMISSION on The Federal Bureau of Investigation, Counterterrorism Intelligence, and the Events at Fort Hood, Texas, on November 5, 2009,” William H. Webster Commission, Accessed July 2, 2016, 41-52, https://archive.org/details/final-report-of-the-william-h.-webster-commission. Over the next two months, Hasan sent six emails to Awlaki and Awlaki responded to two, after which Hasan continued to email him. Hasan asked several questions about Hamas and the current Israeli-Palestinian conflict, posited an essay scholarship prize for the question “Why is Anwar Al Awlaki a great activist and leader?” and offered to help Awlaki “in accordance with the u.s. Law [sic].”“FINAL REPORT of the WILLIAM H. WEBSTER COMMISSION on The Federal Bureau of Investigation, Counterterrorism Intelligence, and the Events at Fort Hood, Texas, on November 5, 2009,” William H. Webster Commission, Accessed July 2, 2016, 41-52, https://archive.org/details/final-report-of-the-william-h.-webster-commission. In all, Hasan exchanged 16 emails with Anwar al-Awlaki, dated from December 2008 to June 2009.“Anwar Awlaki E-mail Exchange with Fort Hood Shooter Nidal Hasan,” IntelWire, July 19, 2012, http://news.intelwire.com/2012/07/the-following-e-mails-between-maj.html. In July 2009, Hasan moved to the Fort Hood military post, pending an almost certain deployment to Iraq or Afghanistan.James C. McKinley Jr. and James Dao, “Fort Hood Gunman Gave Signals Before His Rampage,” New York Times, November 8, 2009, www.nytimes.com/2009/11/09/us/09reconstruct.html?pagewanted=all&_r=1. Two weeks after his move, Hasan purchased a Herstal FN Five-Seven handgun from a gun store in Killeen, Texas, allegedly asking clerks for the most technologically advanced weapon available.Jennifer Hlad, “In opening remarks, Hasan says he was ‘on the wrong side’ in US Army uniform,” Stars and Stripes, August 6, 2013, https://archive.org/stream/final-report-of-the-william-h.-webster-commission#page/n0/mode/2up. In October of that year, the U.S. Army notified Hasan he would be deploying to Afghanistan in November.“FINAL REPORT of the WILLIAM H. WEBSTER COMMISSION on The Federal Bureau of Investigation, Counterterrorism Intelligence, and the Events at Fort Hood, Texas, on November 5, 2009,” William H. Webster Commission, Accessed July 2, 2016, 62, https://archive.org/details/final-report-of-the-william-h.-webster-commission. On November 5, Hasan entered the Soldier Readiness Processing Center at the Fort Hood military post. He told a civilian clerk to leave the room, yelled “Allahu Akbar,” and began shooting. Hasan specifically sought out uniformed soldiers and killed only one individual who was not in uniform.Jennifer Hlad, “In opening remarks, Hasan says he was ‘on the wrong side’ in US Army uniform,” Stars and Stripes, August 6, 2013, https://archive.org/stream/final-report-of-the-william-h.-webster-commission#page/n0/mode/2up. Hasan killed 13 and wounded another 32 before he was subdued by responding police officers.James C. McKinley Jr. and James Dao, “Fort Hood Gunman Gave Signals Before His Rampage,” New York Times, November 8, 2009, www.nytimes.com/2009/11/09/us/09reconstruct.html?pagewanted=all&_r=1. Hasan was charged with 13 counts of premeditated murder and 32 counts of attempted premediated murder.Michael Muskal and Molly Hennessy-Fiske, “Maj. Nidal Malik Hasan tells court-martial: ‘I am the shooter’,” Los Angeles Times, August 6, 2013, http://articles.latimes.com/2013/aug/06/nation/la-na-nn-nidal-malik-hasan-fort-hood-20130806. In his opening statement at the military tribunal in Fort Hood, Hasan declared himself the shooter and said that he was a member of the “mujhadeen [holy warriors].”Jennifer Hlad, “In opening remarks, Hasan says he was ‘on the wrong side’ in US Army uniform,” Stars and Stripes, August 6, 2013, https://archive.org/stream/final-report-of-the-william-h.-webster-commission#page/n0/mode/2up. Hasan also said that as a member of the U.S. Army, he found himself on the “wrong side,” and had “switched sides.”Josh Rubin and Matt Smith, “‘I am the shooter,’ Nidal Hasan tells Fort Hood court-martial,” CNN, August 6, 2013, www.cnn.com/2013/08/06/justice/hasan-court-martial/. The judge struck down an attempt by Hasan to frame his attack as an effort to protect Taliban fighters in Afghanistan.Michael Muskal and Molly Hennessy-Fiske, “Maj. Nidal Malik Hasan tells court-martial: ‘I am the shooter’,” Los Angeles Times, August 6, 2013, http://articles.latimes.com/2013/aug/06/nation/la-na-nn-nidal-malik-hasan-fort-hood-20130806. Roughly one year after the shooting, Awlaki praised Hasan, stating, “How can we object to...Nidal Hasan’s operation. He killed American soldiers who were on their way to Afghanistan and Iraq. Who would object to that?”Jeremy Havardi, “The children of Anwar Al-Awlaki,” Commentator, May 23, 2013, www.thecommentator.com/article/3605/the_children_of_anwar_al_awlaki. Statements by Hasan’s acquaintances following the attack reveal that Hasan viewed his military service as deeply in conflict with his religion. According to Duane Reasoner Jr., a friend of Hasan’s who attended mosque, “[Hasan] felt he was supposed to quit [the army]… In the Koran, it says you are not supposed to have alliances with Jews or Christians, and if you are killed in the military fighting against Muslims, you will go to hell.” Reasoner characterized Hasan as “very upset” and stated, “He didn’t want to go to Afghanistan.” In 2004, Hasan reportedly sought legal advice in an effort to terminate his Army contract, which was set to last until 2010. On one occasion in 2009, Hasan asked Osman Danquah—a veteran of the first Gulf War and the cofounder of Killeen mosque which Hasan attended—how he should counsel Muslim soldiers objecting to the wars in Iraq and Afghanistan. Danquah later told the media, “I got the impression he was trying to validate how he was dealing with it.”James C. McKinley Jr. and James Dao, “Fort Hood Gunman Gave Signals Before His Rampage,” New York Times, November 8, 2009, www.nytimes.com/2009/11/09/us/09reconstruct.html?pagewanted=all&_r=1. Though Hasan did not plead guilty to charges, he refused to field a defense and suggested that an execution would be his martyrdom. In August 2013, the military court found Hasan guilty on all charges and sentenced him to death.Manny Fernandez, “Death Penalty for Rampage at Fort Hood,” New York Times, August 28, 2013, www.nytimes.com/2013/08/29/us/jury-weighs-sentence-for-fort-hood-shooting.html?_r=0. Hasan remains on military death row in Fort Leavenworth, Kansas.“Fort Leavenworth death row inmate Nidal Hasan appears at hearing in Fort Hood massacre case,” Dallas Morning News, January 29, 2015, www.dallasnews.com/news/state/headlines/20150129-fort-leavenworth-death-row-inmate-nidal-hasan-appears-at-hearing-in-fort-hood-massacre-case.ece. Place of Birth Arlington, Virginia, U.S.
Nidal Hasan is a U.S. citizen of Palestinian descent and a convicted domestic terrorist. Jennifer Hlad, “In opening remarks, Hasan says he was ‘on the wrong side’ in US Army uniform,” Stars and Stripes, August 6, 2013, https://archive.org/stream/final-report-of-the-william-h.-webster-commission#page/n0/mode/2up. “I heard a speaker defending suicide bombings as permissible…The logic seems to make sense to me.”“Anwar Awlaki E-mail Exchange with Fort Hood Shooter Nidal Hasan,” IntelWire, July 19, 2012, http://news.intelwire.com/2012/07/the-following-e-mails-between-maj.html.